Managed VPS Affiliates: Make $100 Per Managed VPS Hosting Referral! We’ve increased our vps affiliates payout for fully managed VPS hosting plans. Each referral made which results in a managed VPS signup will land you a $100 commission! Referring shared, reseller or self managed VPS’s? Get a $50 commission for every referral you make! Fully Managed vs Self-Managed VPS Hosting – Which One Do I Need? In this article we’ll go over some of the differences between a fully-managed VPS and a self-managed or “unmanaged” VPS. Depending on your requirements, you may find that a self-managed VPS could be more expensive for you in the long run. As you can see from the list above, a fully-managed VPS includes a wealth of features, leaving nearly nothing for you to manage except for your websites. Some hosting providers have specific roles in management for fully-managed VPS’s. However, we feel there should not be a grey area. A managed VPS solution will be thoroughly configured & tested before providing the VPS so you can focus on bringing your applications and websites online as quickly as possible. This methodology has proven to be very successful for both VeeroTech and our customers because it maximizes stability and up-time. In addition to the self-managed responsibilities, if you were unable to perform these yourself, you would be required to utilize a 3rd party server management company or hire a systems administrator to manage your server. The costs of that alone would more than likely be higher than starting directly with a fully-managed VPS. Any software licensing such as cPanel, LiteSpeed, CloudLinux or Softaculous would be additional costs as well. 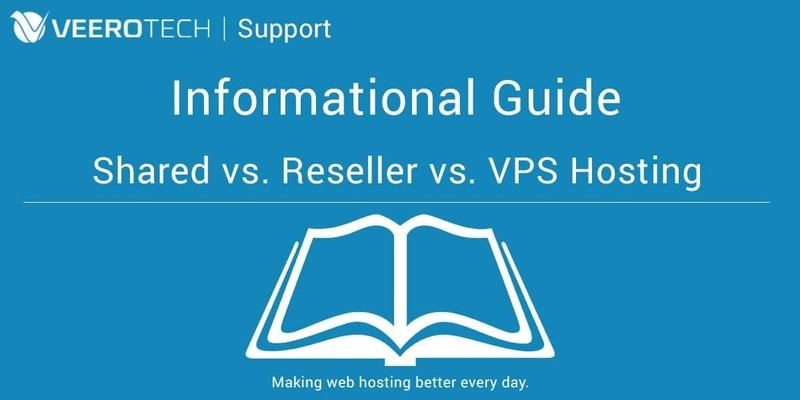 What are the Differences Between Shared vs. Reseller vs. VPS Hosting? What’s the difference between Shared, Reseller and VPS hosting? If you are new to web hosting you will see plans listed on hosting provider’s websites that are typically categorized as shared hosting, reseller hosting and VPS hosting. In this information blog post we’ll explain the differences so you can make to an educated decision based on your web hosting needs. Shared hosting plans are “single user” plans that are designed for single website applications. This is typically used by a small business that has a single website or an individual looking to host their portfolio site, blog site, forum to just get started learning how to do website development. Shared hosting plans can also host multiple websites using what’s called “addon domains”. These are simply sub-directories under the main account with DNS maps that point to them. While hosting multiple sites on a single account may sound good, there’s actually a lot of performance and security issues that can arise from doing this. For example, let’s say you have a shared hosting account with 10 addon domains and one of them were to get hacked – now the hacker has access to all the other websites residing on this account. To add to security concerns, you will have performance issues. Each account (cPanel account or shared account) is allocated a certain amount of resources (memory, CPU and disk IO). Every additional website that is added to this single hosting account consumes more of the finite resources that are available. As more websites are added, they start to compete against each other for memory, CPU and disk IO (commonly called contention) which ultimately will slow down all of the websites hosted on the account. If you plan to host multiple websites then choosing a reseller account will be the better choice. What’s in a name? Before explaining what a reseller account is let’s clarify the term “reseller.” A reseller account is not just for those people interested reselling web hosting. It’s primary function is to properly partition or separate multiple hosted websites into their own “containers.” So when you read the term “reseller hosting” you’ll know it applies to more than just the aforementioned group. Reseller hosting is similar to shared hosting with one major difference: You have a dashboard to manage multiple single accounts. This means with a reseller hosting account, you can create multiple “shared” style hosting plans and use a single dashboard (WHM) to manage them. As additional websites are added each can be assigned to its own cPanel account. Each account then has its own unique login, username and password, email accounts, and most importantly, its own resources. This ensures each site is more secure and has access to it’s memory, CPU and disk IO. In addition to simply using a reseller plan for hosting multiple websites, many “hosting resellers” utilize reseller plans from a parent provider such as VeeroTech to sell web hosting to their clients. You can utilize the included billing software (WHMCS) to automatically bill your clients, provide a support desk and automatically provision hosting accounts from automated ordering. Reseller hosting accounts are also great for web designers, development firms, and companies that need to host multiple website accounts. There are three types of VPS solutions that we offer at VeeroTech Systems: Managed VPS, Self Managed VPS (Full Root VPS), and Storage/Backup VPS. A fully managed VPS is a virtual server that is fully managed by our staff. Our engineers monitor, tune and maintain the each VPS and respond to any issues that may arise. We handle all of the server-side tasks, daily backups as well as customer requests that may need to be completed. The most common operating systems deployed on a VPS are flavors of Linux like CentOS and Ubuntu. A managed VPS is ideal for those who require an isolated solution or larger amounts of dedicated resources but don’t want to hassle of managing a server. Our managed VPS’s also include a licensed version of cPanel & WHM, firewall, Softaculous script installer, R1Soft backups & more. A storage or backup VPS is a great alternative to other “cloud storage” providers if you want and extra layer of security and management because not only is it your data, but it is on your server. These are full root access Linux VPS’s. Unless you are sure you need a VPS starting with shared hosting or reseller hosting account are less expensive solutions that can handle most needs. If you are unsure which way to go feel free to ask us.